Members of the European Parliament have cast their votes overwhelmingly in favor of a new directive that introduces stricter countermeasures against money laundering across Europe — a move that will have consequences for crypto investors. The new edict is titled the Fifth Anti-Money Laundering Directive. Its proposals included stricter border controls, tighter laws on firearms and more inclusive information sharing policy amongst state bodies. Additionally, the legislation aimed to introduce stricter controls for tax-related activities because of evident causation between funding and terrorism and other crimes. The new directive touched on a number of aspects of the global financial system. The legislation allows for enhanced state access to information about the owners of firms in the EU. This is to ensure that letterbox companies cannot be used to evade tax as was the practice by the parties embroiled in the Panama papers scandal. In order to make this enhanced access to data possible, all obliged entities would be required to gather and store data on their customers as well as related parties. “The proposed 5AMLD imposes some new due diligence obligations which obliged entities — financial institutions, related professionals, trust and gambling service providers, real estate agents, etc. — must apply to their clients, both new and existing. This article of the directive affects the cryptocurrency sector because the term ‘obliged entities’ was widened to include electronic wallet providers and crypto exchanges. Currently, many cryptocurrency service providers allow for transactions to be processed without thorough verification until a certain threshold is reached. 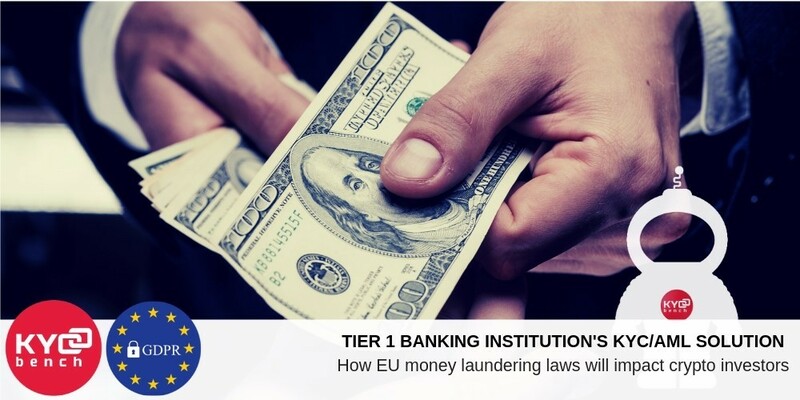 Although many service providers have taken measures to implement KYC/AML practices (Know Your Customer / Anti Money Laundering), the new laws will make thorough KYC/AML compliance mandatory for all of Europe. Interestingly, a paper published by blockchain intelligence firm Elliptic identified Europe as the region where criminals currently have the most opportunities to cash cryptocurrency out into fiat currency. How will this impact Crypto investors? While most within the cryptocurrency industry are striving for legitimacy and motivated to leave its Wild West days behind, many in the political class still regard the sector with suspicion due to its associations with criminal activity on the dark web. While cryptocurrency is not the cause of such activities, the relative anonymity provided by digital currencies can play a part in facilitating crime. A European member of parliament, Krisjanis Karins, explained that the legislation was created in order to keep up with advancements in technology that can be used to facilitate criminal activity. This new regulation likely means that customers will need to input more of their personal information and provide more state verifiable documentation when registering for a wallet or an exchange. It is also likely that users may need to divulge more information on the recipients of their transactions or any other otherwise related parties. As in Japan, legislators will also likely view license applications by exchanges negatively if such exchanges continue to trade ‘anonymous’ coins like Monero and Dash. While new KYC/AML processes will increase sign up times for cryptocurrency services, the new legislation will most likely turn into a positive for cryptocurrency investors because the more bad actors are being flushed out of the sector, the more legitimacy it will gain. This, in turn, could lead to an influx of investor money, which would push up asset valuations. EU member states have 18 months to prepare to ratify the directive into their respective national laws. All times are GMT. This page was generated at 04:21 AM.